We understand the stress you have when you even think of the work load and every little detail of things that should be done when planning an event. Today, it’s always the best and most convenient option is to leave the load of work and stress in the hands of an event manager. The tricky and challenging part is finding right event management company. Every successful event depends on an experienced, creative and reliable event management company. Despite the type of the event being a Conference, Seminar, AGM, Gala Dinner, Product Launch or any Corporate event the basics remain the same.In simple terms, you could be at peace if you select the right event management company knowing that all is and will be in perfect place. Yet, a single mistake of selecting the wrong company and you will end up facing a thousand problems and disappointments just because of it. Here, we have together and listed the most important tips when selecting a event management company. 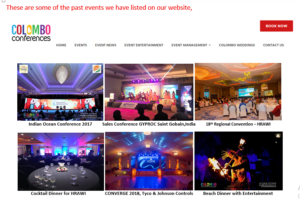 It is a trend today to start event management companies with a fancy website and some very good content but that is not it. Event planning and managing looks easy for those who many have participated in events, volunteered, helped in organizing a friend’s party or simply has an interest in it. Rule No.01, keep away from newbies! An event cannot be a trial at any point, a good event is a error free event. After all, there is no going back after your guests are disappointed or if your vision wasn’t the reality. Therefore, your main concern has to be looking for experience. Go through their blogs, portfolio including social media accounts. Research on what they have done in the past and the quality of their events. Understand their work and contact them for more. Reach out to them directly and get a clear understanding about their past events. You can always google what you are exactly looking for and hundreds of event management companies will show up specifying what you need but how sure can you be if that is the expertise you need? Event management companies are experts in various fields yet most of them are not all rounders. You have to select a company that could provide a personalized service to you with an expertise in your type of event or simply be an all rounder to plan your event. Here’s the shortcut, if you’re looking for someone to plan and manage your event in Sri Lanka with a friendly, personalized service giving you an experience of unique Sri Lankan culture and a provider for quality entertainment options with top of the range audio visual equipment, staging, experienced technical support and with creative production, talk to us. Confident event management companies do not hesitate to put up their clients’ feedback on their website; for any of their potential clients or simply anyone to see. If in case, you do not see their testimonials; you are always free to ask because you are supposed to know literally everything! If an event management company is constantly handling quality events, repeat events and better feedback/testimonials is definitely a positive factor. Therefore, we, Colombo Conferences, believe in true transparency and providing the correct information with any of our clients. Usually, event management companies execute planning the event perfectly; yet they fail in managing the quality of it due to low quality or poor condition equipment which was hired. It is added value to own quality equipment than hire it from a source the client has no knowledge about. This is a huge risk to undertake as it is a key factor at any event to run smooth. The last but definitely not the least, the most important factor is selecting the right service provider. The service plays the key role in planning and executing any event. An event management company cannot exceed or meet client expectations if they do not provide a personalized and efficient service. First and foremost, you should be comfortable with your event manager; to communicate your expectations, concerns and problems you have regarding the event to organize a successful event. Contact them and arrange a meeting. This helps to get to know each other, build a relationship and have a mutual understanding of the event. Put your event in good hands! Don’t pick out just any company with a website and concise content; pick the one with better details whose expertise is suitable to handle your event and call them right away! Be in touch with them and communicate your expectation to the right company. Colombo Conferences is a leading event management company in Sri Lanka specialized in various types of events and well known for their hospitality and personalized unique service which never fails to exceed client expectations. If you are planning your next event in Sri Lanka, don’t forget to give us a call on +94 777935559 / +94 777835991 and we will be more than happy to support you. If you don’t, Click here to find out why you should definitely consider hosting your next event in Sri Lanka with us.